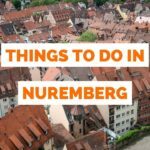 Join as we visit Nuremberg, Germany on a trip to wander around with the aim of doing the best things in Nuremberg. As the second largest city in Bavaria, Nürnberg has a lot offer in terms of castles, museums and unique cuisine worth sampling. As a very walkable and tourist friendly city you can cover most attractions in Nuremberg in just a day or two making it a perfect weekend retreat. We honestly arrived without the highest of expectations but we left feeling as though we wanted to spend extra time in Nuremberg. Now let’s see what this fascinating city in Germany has to offer a first time visitor.